Ludwig Moser (1833-1916) originally a retailer opened a workshop at Karlsbad in 1857. In 1893 took over Meierhofen, Novy Dvory nr Karlsbad. Richard & Leo Moser incorporated Meyrs Neffe (Adolf Glassworks) in 1922. The firm still operates today. See encyclopedia. 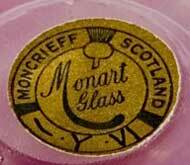 L. Moser - flat cut thick coloured glass. Moulded clear glass containing inclusions of coloured glass, dark blue, purple & amber vases wih geometric cut patterns with frieze of classical scenes or animals in shallow relief & gilt. J. Hoffmann - opaque purple or black glass ornaments, goblets, bookends, lampstands moulded with female nudes or animals. 1990s - Clear flat cut glass vases and simple gilt glass in early Moser style. Freizes of flowers. © 2006 Style and Design All Rights Reserved. No site contents to be reproduced in any way without the prior and express permission of Style & Design.